Actress Tracey Birdsall, known to sci-fi and fantasy fans for her starring roles in Rogue Warrior : Robot Fighter and Evolution War, lost her home and all possessions in last week’s devastating fire in Malibu. 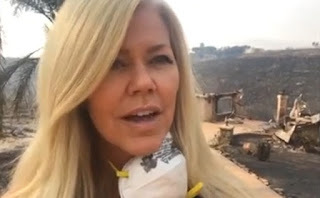 "November 10, 2018, the Woolsey fire which raged through Malibu destroyed the home of Tracey Birdsall and her family. As her oldest daughter, aware of the devastation this has caused in her life, I decided to create a GoFundMe for her so people could contribute and support her. She lived in this home since 2006, raising my younger siblings, being involved in the community, and it was completely destroyed. Only a few succulents still stand in the front yard, and a lone tangerine tree in the back yard. Perhaps most eerie is the standing garage doors, their metal warped and nothing else of the garage present. As many of you who knew her know, the changing times in her industry and distribution have made the past few years very difficult for her, even though she was working constantly or trying to help others get work, and this was the last thing she owned. Oddly enough, this week is also the one year anniversary since her mother (my grandmother) died of Alzheimer’s after a lengthy battle - which tore her apart day by day, week by week, and year by year. My mother bought this home herself, and worked tirelessly every day of her life leading up to this catastrophe in order to provide a place for her family to live. She welcomed friends to not only stay with her, but numerous people over the years have also been welcomed into her home to treat it as their own when they were going through troubles of their own. There was always a blanket and a pillow to be found and a warm meal. Her home was a haven to people she knew, and she opened her heart and her doors to many numerous people, far too many to even count. Although insurance will undoubtedly help eventually, she was minimally insured and even her fireproof safe in the garage in which she kept resources for emergencies - was turned to unrecognizable dust. Several priceless sentimental items are gone forever, and she hasn't even begun to process their loss. Perhaps even worse, a neighbor two doors down said that he could have put out the fire, he brought a hose to the front yard just as the City of Malibu shut off the water… I mean, who shuts off the water supply when there are fires? This hose still sat limp in the street when she came to see what was her home. I've never seen her shoulder's so slumped, or the way her fingers tremble while she keeps repeating how glad she is everyone made it out, that her neighbors are okay. She's always been the sort to hide her tears when it's not for a script. My mother's always been the strong one, but she has never seemed as frail as now. Any support and assistance would be greatly appreciated no matter how small. Please help in any way that you can understanding the struggles she has endured, and the tireless hours she works. She is the most loving, caring, understanding, and wonderful mother and friend anyone could ask for. I thank you from the bottom of my heart. I don’t know what else to do to help her, so I’ve organized this for her."